Flowers are in full bloom! Everyone is invited to take the bus/MRT to visit Zhuzihu! The 2019 Calla Lily Festival takes place from March 29 through April 28. To make the trip up the mountain easily accessible for everyone, the Department of Economic Development (DOED) and the Public Transportation Office (PTO) have specially assigned Flower Festival Express Route 131 (Yangmingshan National Park – Zhuzihu) and Leisure Bus Route 128 to extend its route to Zhuzihu during the Festival, as well as increasing the frequency of services of Leisure Bus Route 129. Besides Routes 128 and 129, which operate only on the weekends and the holidays, the other routes are available every day of the week. Visitors are encouraged to take public transportation to enjoy an easy trip up to Zhuzihu and immerse themselves in the romantic sea of white calla lilies! Commissioner Lin Chung-chieh of DOED stated that white calla lilies currently account for 80-90% of the flower’s overall production on the island. The annual Calla Lily Festival has become a major tourism marketing attraction in Taipei City, and now is the perfect time to come up to Zhuzihu to enjoy them. Tourists usually peak on weekends and holidays or during the flower season, so it is highly recommended for visitors to fully utilize mass transportation services via MRT and transfer via bus. One can take Routes S8 or 128 at MRT Shipai Station, as well as Routes S9 or 129 at MRT Beitou Station to reach Zhuzihu. Other options include boarding Routes 109, 111, Red 5, or 260 (including shuttles and Flower Clock Route), or Route 260 (including shuttles and Flower Clock Route) at Taipei Main Station to reach Yangmingshan Bus Terminal, and then transfer via Routes 128, 129, 131, S8, or S9 to reach Zhuzihu. 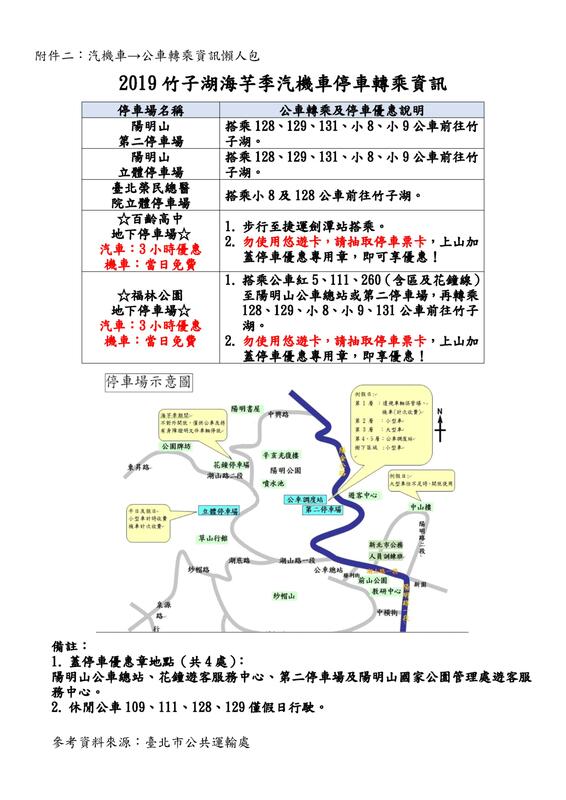 To make everyone's trip to Zhuzihu pleasant and enjoyable every day of the week, DOED has organized a transportation “cheat sheet” for all available routes that will take the visitors up to Zhuzihu at Yangmingshan. Please visit the DOED’s Official Website or DOED's Facebook page “北市產業局－台北饗樂趣” for more information. Visitors from Taipei are also encouraged to make use of City Government Apps “台北好行” and “台北捷運GO.” Taipei City Government hopes that everyone will have an easy and convenient trip up to Yangmingshan to enjoy the flower season!